What Do You Need To Make Chocolate Bark? 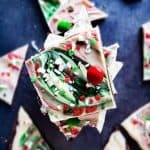 This Christmas Chocolate Bark recipe requires only one real ingredient: chocolate, and lots of it. The base is composed of two types of chocolate and then topped with a bunch of different kinds of treats. You can top it with whatever you like, go crazy! There really is no limits (okay, maybe nothing weird like pepperoni) to what you can top the bark with. 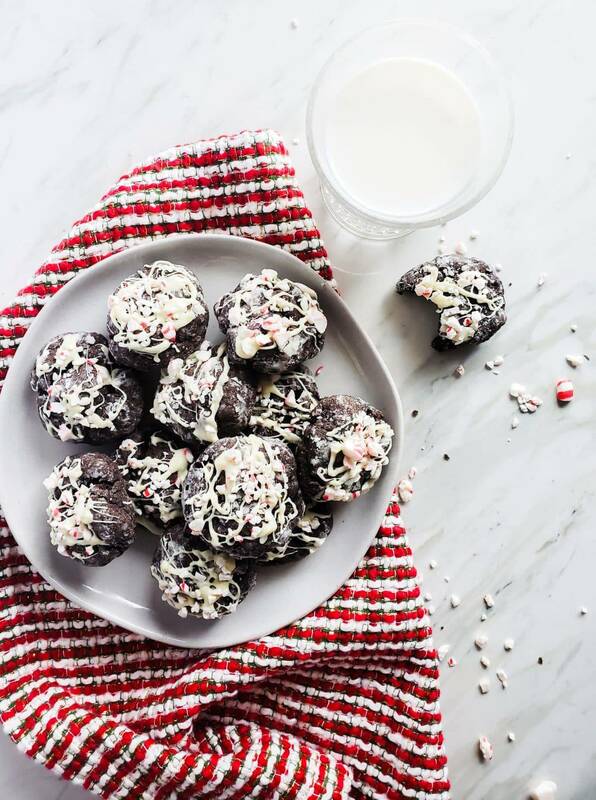 Some of my favorites outside of this recipe are crushed Oreo’s, Peppermint Patty’s, caramel, Ginger Snaps, Hershey’s Kisses, dried fruit, nuts, and pretzels. Can you tell this is one of my favorites around the holidays?! This is the easiest holiday treat you can make, IMO. All you are doing is melting chocolate, letting it set, topping it with treats, then eating it. Super duper simple. The setting part does take some time though. So while this is a very simple recipe it does require you to wait about 2 hours while it gets all hard and bark-like. Therefore, make sure you have room in you fridge because this tray of goodness will need to hang out it in for awhile. First, you will need to make layer one. Before you do anything lay your parchment paper on your cookie sheet. I like to leave it spilling over the edge so that I can easily remove the chocolate bark once it has set. If you do not use parchment paper the chocolate will stick to the pan and it’s going to be a real fun time getting it out. Trust me, I have been there and you really don’t want to skip this step. Next, melt the semi-sweet chocolate in the microwave or stove-top until smooth. Pour the chocolate onto the cookie sheet and smooth it out with the back of a spoon, butter knife, or icing spatula. Once you have it smooth and even, pop it in the fridge and come back in an hour. Next, you will need to make the second layer. Once the first layer of chocolate is solid remove it from the fridge. Melt the white chocolate and pour it over top of the semi-sweet chocolate layer. Smooth the chocolate out just like the first layer until you have an even layer. Now it is time for the fun part! The toppings! Take your red and green food coloring and drops about 7-10 drops of each randomly all over the top. Use the tip of your knife or spatula to swirl the colors around and together. 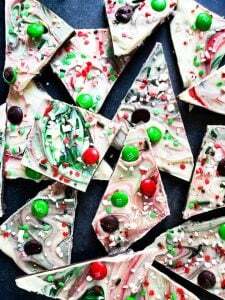 Don’t over swirl or you will have mud colored Christmas chocolate bark. Finally, top with M&M’s, chocolate chips, sprinkles, and crushed peppermint or your toppings of choice. I just sprinkled mine all over randomly. Next, place the cookie sheet back into the fridge for another hour or until the bark is completely solid. Once solid you can remove the bark from the cookie sheet and slice it into pieces. Enjoy immediately or store in the fridge until you plan to serve it or gift it. How Long Is Chocolate Bark Good For? I love chocolate bark for many reasons: it tastes amazing, simple to make, AND it keeps forever. Stored in an airtight container in the fridge it will stay good for 2-3 weeks! That is basically all of February. Honestly, it has never lasted that long in my house, but this is perfect to snack on well after Christmas and New Years. If you decide to leave it out at room temperature it will last for about 5 days. Therefore, I definitely recommend storing it in the fridge to extend the bark’s shelf life. This year I will be making the majority of the gifts I will give for Christmas. 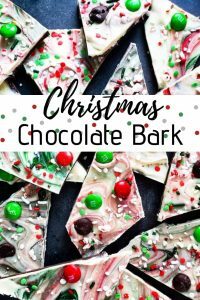 This Christmas Chocolate Bark is the perfect gift because this recipe makes a lot of bark. I can cut the pieces as big or as small as I want and I have plenty for everyone. This also lasts for awhile so I can make it ahead of time and not have to worry about doing last minute. Also, I can customize the flavor to each person and make it unique and special just for them. Plus, I know I love getting treats as a gift so I think everyone will love this. Looking For More Holiday Treats?! I hope you and your family have a wonderful holiday season. Whether you are making this for yourself or as a gift enjoy! 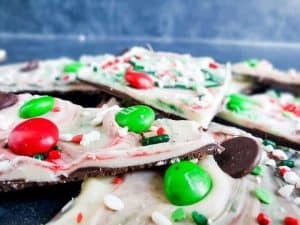 Why Christmas Chocolate Bark is the BEST! 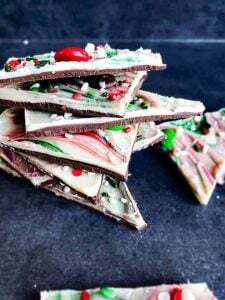 The perfect Christmas Chocolate Bark for a treat of a holiday gift. 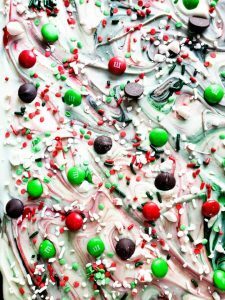 Loaded with two types of chocolate, peppermint and candy make this bark perfectly sweet and indulgent. Lay parchment paper down on a cookie sheet. Melt semi-sweet chocolate in the microwave until smooth. Spread melted semi-sweet chocolate in an even layer so it covers the majority of the sheet. Refrigerate for 1 hour. After 1 hour remove the tray from the refrigerator, it should be solid. Melt white chocolate in the microwave and spread it on top of the semi-sweet chocolate in a even layer. Add drops of red and green food dye (about 7-10 of each) all over the white chocolate and use the tip of a butter knife to swirl them together. 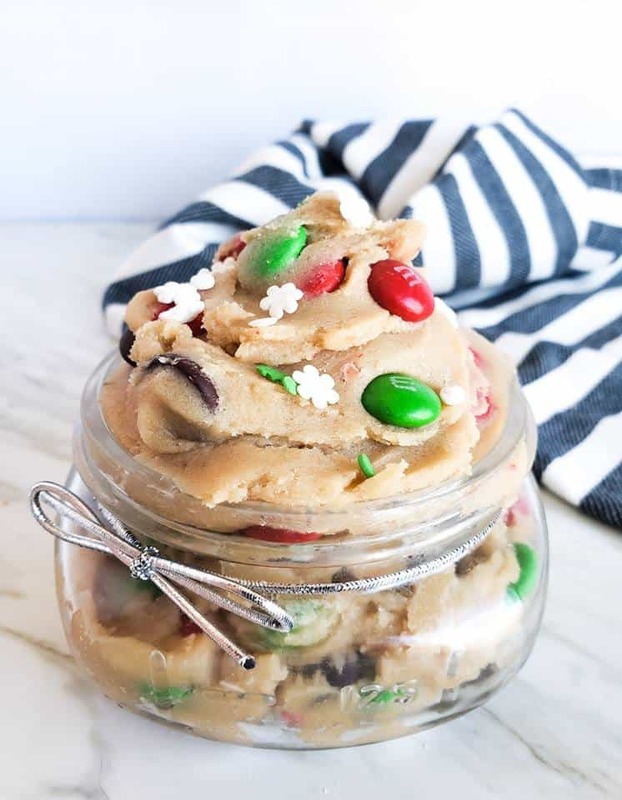 Top with M&M's, Sprinkles, Crushed Peppermint, and Chocolate Chips. Refrigerate for another hour. Remove from refrigerator and either cut or break the bark in chunks. I like to pull mine out of the cookie sheet first. Store in the refrigerator until time to serve or gift. Enjoy! I love the colourful swirl effect on the bark, it looks absolutely beautiful! Thanks! I think it is so pretty! This colorful chocolate bark is perfect for gifting or stealing for snacking this time of the year! This is the perfect edible gift. It’s so colorful and festive ! Oh my goodness, Caitlyn- this bark is so gorgeous! I love the beautiful swirls and how easy it is to adapt to your favorite toppings and what you may have on hand. Perfect for making a special treat that’s also simple during this busy season!! Thanks so much! I love how customizable this is as well! Perfect for the busy holidays!